Sixty percent of adult Americans are overweight, and thirty percent are obese. And our bad habits are affecting our kids, whose life expectancy, shockingly, sadly, will be less than our generation, a major step back in quality of life that is entirely preventable. “It’s not just about the elderly and people who have had heart attacks. It’s not just about those folks with a lot of stress. It’s also about the kids, and the Y has a great representation of children. So we thought, If we come out and have some things that are interesting for the children, we can get them engaged in their own health and health outcomes,” said Arlene Macallero, the director of physician recruitment at Augusta Health, who has been working with the Waynesboro YMCA on the development of a preventive-wellness program that gets the message of heart health out to the masses. The two organizations teamed up on Thursday to present a community health fair at the YMCA that focused on health education – for kids and their parents. “There’s a lot of misinformation in the public with regards to their health. They can get on the Internet and go to a million sites, but not all of them present accurate information. The goal of these kinds of events is to educate the public with the right information and to let them know what we have to offer in terms of education programs, classes, et cetera,” said Kara McGill-Meeks, a clinical dietitian at Augusta Health. The pressures for kids today come from all sides. Schools have been cutting back on physical-education classes to be able to commit more time to classroom learning to meet standardized-testing output objectives. Kids are less likely to be active with parents more protective of them in the face of fears of abduction by strangers and gangs and other illicit activities – and the increasing popularity of video games that have them plopping in front of the TV for long stretches. And what we feed ourselves and our kids has ratcheted up dramatically in terms of caloric intake. “We’re not asking people to starve themselves to death or give up everything. We’re just saying, Let’s look at moderation. We’ve been overeating salt, overeating fat, overeating sugar, underactivity. We need to change that whole culture,” said Jane Blosser, the clinical coordinator of the Clinical Nutrition Services Department at Augusta Health. That goes for all age groups. 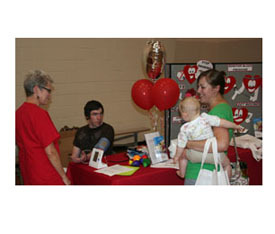 The buzzword at the health fair was prevention. Baby steps. That’s all it takes. “This is about getting the public in, showing them how easy it is, and how much it makes a difference,” Wilson said.